A leading figure in the Aesthetic Movement, James McNeill Whistler credited Japanese art with having a profound impact on his own artistic activities, which included painting, printmaking, and interior decoration. Indeed, the Japanese cultivation of beauty in all aspects of material life informed his own “art for art’s sake” philosophy. This sensibility led Whistler to shift from naturalistic representation in his pictures toward more abstract, evocative arrangements of color and form in the late 1860s. 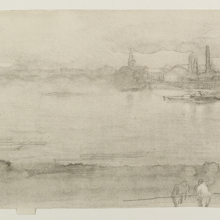 In this image of London’s Battersea district across the Thames, the asymmetrical composition and emphasis on the misty atmospheric effects of early light reveal the artist’s debt to Japanese art, transforming the urban industrial landscape into a thing of poetic beauty. Among the most popular Japanese prints in the West were the late eighteenth- and nineteenth-century ukiyo-e (literally “pictures of the floating world”) that depicted urban leisure pursuits, everyday life, and famous landscapes. An exhibition of more than seven hundred ukiyo-e in Paris in 1890 inspired the expatriate Impressionist Mary Cassatt to experiment with color printmaking, resulting in her most formally daring and technically ambitious works. 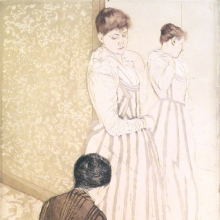 In the manner of Japanese print series, she conceived of a set of ten images, including The Fitting, depicting the daily activities of a typical middle-class woman. While Cassatt emulated the Japanese style—evident in the flattened forms, unmodulated planes of color, and strong decorative outlines—her technique was a highly inventive combination of printing processes that garnered critical admiration in Europe and America. Commodore Matthew Perry’s 1853–54 voyage to Japan not only reestablished diplomatic and mercantile relations between that country and the West for the first time since the seventeenth century, but also opened the floodgates for cultural exchanges that would profoundly affect Western art. In the ensuing decades, Japanese artifacts poured into Europe and America, appearing in exhibitions, import shops, and art collections, as well as in articles and books. 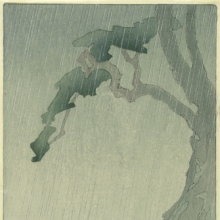 Western artists began incorporating Japanese motifs, aesthetic principles, and techniques into their work—a phenomenon known by the French term “Japonisme.” This widespread fascination with Japanese objects dovetailed with late-nineteenth-century artistic developments, including the interest in foreign cultures as well as reformist impulses. Japanese art’s emphasis on beautiful design and hand-craftsmanship, for instance, resonated with the “art for art’s sake” philosophy advocated by the Aesthetic Movement as a remedy for the ills of modern industrial life. Progressive styles such as Impressionism also gained inspiration from Japanese prototypes in revitalizing Western pictorial traditions. Inspired by their encounters with the arts of Japan, the artists featured in Japonisme in American Graphic Art, 1880–1920 adopted Japanese subjects and design elements, embraced Eastern aesthetic principles, and sometimes even traveled to Japan to study its cultural traditions firsthand. Their resulting works demonstrate the variety and breadth of Japanese influence on American graphic arts at the turn of the twentieth century. 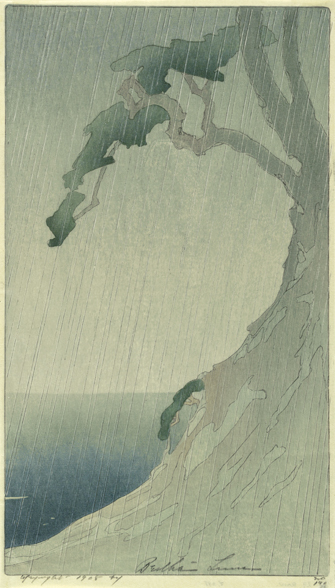 Japonisme in American Graphic Art, 1880–1920 was organized by Karen A. Sherry, Assistant Curator of American Art.